Click the image to view the full 2018 volleyball schedule. Seven days is all that’s left of the offseason before many teams take the floor for the 2018 regular season. Forty-six games are scheduled for Thursday, Aug. 23, including a Class 3A tilt between Grand Rapids and Stillwater. Last fall, the Thunderhawks staked a five-set victory over the Ponies, who aim to avenge the loss and prove their No. 4-ranking in the preseason coaches’ poll. That Saturday, 16 games will be played at the Hopkins Lindbergh Center for the Breakdown Sports Side Out Classic. No. 7-3A Hopkins and No. 2-3A Champlin Park are slated for the nightcap at 7 p.m. in a top-10 showdown. Defending Class 3A champion and top-ranked Lakeville North faces South Suburban Conference rival Eagan on Thursday, Sept. 27 in a rematch of last year’s state title game. The Panthers didn’t win a set against the Wildcats in the regular season but prevailed at the Xcel Energy Center by ousting Eagan 3-1 to claim the program’s third state crown. Mayer Lutheran visits Maple Lake on Oct. 9, in what’s become a premier matchup on the small-school scene. The Crusaders have won the past two Class 1A championships, while the Irish are two-time defending Class 2A champions after coming off a perfect season in 2017. Maple Lake defeated Mayer Lutheran 3-1 last year and will aim to prove its mettle with a fresh rotation. A week later, many teams will be playing in their final regular season game and two Hiawatha Valley League rivals have opted to save their regular-season meeting to set the tone for the postseason. No. 3-2A Stewartville visits No. 2-2A Kasson-Mantorville in a match that will likely decide the league championship and play into section seeding on Oct. 16. The KoMets fell to Stewartville 3-0 in the 2017 regular season, but defeated the KoMets in the Section 1 final 3-1. 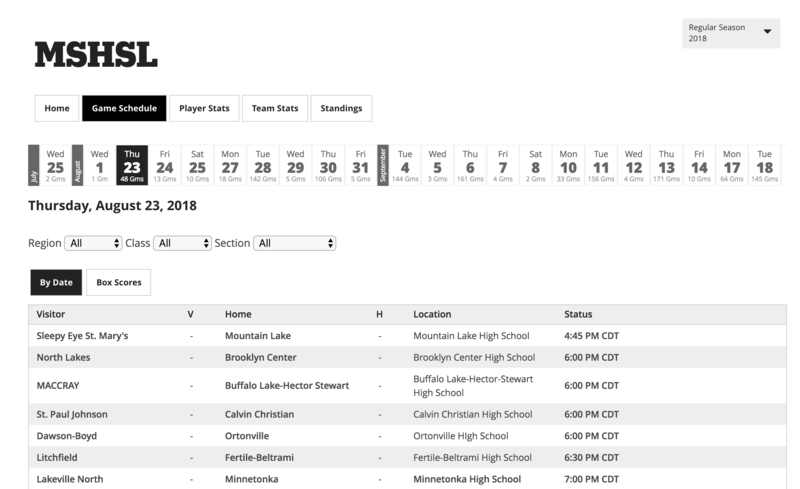 Click here to view the full schedule, or go to the "Search" box at the top right corner of the page and type the name of your favorite squad into "Team Finder" for that team's specific schedule.